On May 23, the Governor vetoed House File (HF) 947, the tax and education bill passed by the Minnesota House and Senate on the last day of the 2018 legislative session. Its conservative authors argued that it will increase corporate taxes relative to current law. A deeper dive into the available information reveals that the bill would have reduced corporate taxes over the long term. First, some background. The Tax Cuts and Jobs Act (TCJA) passed by Congress late last year suspended or altered a number corporate exclusions and deductions, which increased federally taxable corporate income. The TCJA also contained a huge reduction in the federal corporate tax rate from 35% to 21%. The net effect of rate reductions more than offset the increase in taxable income, resulting in an enormous reduction in federal corporate income taxes. The estimated reduction in federal taxes paid by Minnesota corporations due to the TCJA is estimated to be $1.53 billion in 2019 alone. By conforming to the changes in the TCJA which increase corporate tax base and making no change to the state corporate income tax rate, the state would generate additional revenue equal to about one-fifth of the federal corporate tax reductions from the TCJA, based on estimates for 2019. This is approximately the approach taken by Governor Dayton in his tax proposal unveiled during the 2018 legislative session. Conservative majorities in both the House and Senate balked at the idea of such a significant increase in state taxes on corporations, even if it amounted to a small fraction of the federal tax relief windfall that corporations received through the TCJA. They argued that their approach—as embodied in HF 947—would increase corporate taxes, but by a much smaller amount. In the short term, the vetoed legislative tax bill would have increased state corporate taxes. For example, for every dollar of federal corporate tax breaks received through the TCJA in 2019, the legislative tax bill would have increased state corporate taxes by 2.5 cents. Meanwhile, the Governor’s tax proposal would increase state corporate income taxes by about 17.9 cents for each dollar of federal relief from the TCJA. The impact of the vetoed tax bill on corporate income taxes changes significantly over time for two reasons. First, the state corporate income tax rate would drop by 0.15% (from 9.8% to 9.65%) in tax years 2018 and 2019, resulting in a relatively modest corporate tax reduction. However, the corporate income tax rate reduction more than quadruples to 0.7% (from 9.8% to 9.1%) by tax year 2020. 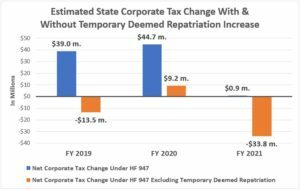 By the time the impact of this corporate rate reduction is fully realized in fiscal year (FY) 2021, the rate reductions will fully offset all state corporate tax increases resulting from conformity, producing virtually no net change in state corporate income taxes relative to current law. Second, the short-term corporate income tax increase under the vetoed tax bill is driven largely by conformity to TCJA provisions regarding the deemed “repatriation,” or return, or return, of deferred foreign income.† However, this increase is temporary, eventually reaching zero by 2026. By that time, the remaining provisions of the legislative tax bill will be providing a significant net tax reduction to Minnesota corporations—not an increase. 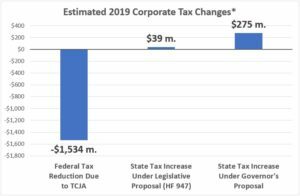 But for this temporary tax increase, the net corporate tax change under the legislative proposal would be minimal in FY 2019 and 2020 and by FY 2021 there would be an estimated $34 million corporate tax reduction. The TCJA provided massive tax breaks to corporations. Claims from conservative legislators notwithstanding, their tax proposal would have ladled out even more tax cuts to corporations in the long run. *The federal corporate tax reduction illustrated here is based on Institute on Tax and Economic Policy estimates for 2019. The state tax increase under Governor’s proposal is based on House Fiscal Analysis Department estimates (March 21, 2018) for FY 2019. The state corporate tax increase under HF 947 is based on House Fiscal Analysis Department estimates (May 23, 2018) for FY 2019.